Andrew E. “Andy” Auxt, 91, a well-known Grace Brethren layman from the Mid-Atlantic district of the FGBC, died Feb. 9, 2010, due to a brain injury sustained in a fall at his home. Born Dec. 24, 1918, in Chambersburg, Pa., he was the son of the late George Andrew and Harriet (Pugh) Auxt. He was a 1934 graduate of Chambersburg High School as valedictorian at age 15. He attended Strayer College and first entered the work force for the U.S. Government in Washington, D.C. He later moved to Hagerstown, Maryland, where he was employed at Fairchild Aircraft for 35 years. Andy served in the U.S. Navy as a physical instructor during World War II. He wrote as a conservative columnist for the Hagerstown newspaper, The Herald-Mail. His favorite hobby was planting seedling trees and raising them to a good, healthy size, and then planting them at schools, churches, and homes of friends and relatives. 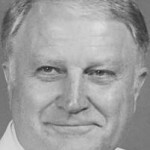 He was a charter member of Maranatha Brethren Church and had served in many capacities having been a Sunday school teacher, Sunday school superintendent, an avid home visitation worker and phone encourager. He taught weight training and body building to teen boys. The Auxts had previously been active in Grace Brethren Church and Calvary Grace Brethren Church of Hagerstown, as well. He served on the Board of Grace College and Grace Theological Seminary in Winona Lake, Indiana. The Auxts were one of the first Grace Brethren families to have three children enrolled in Grace College simultaneously. He is survived by his wife, Mary Jane (Hopkins) Auxt. Andrew was extremely proud of the fact that they would have celebrated their 70th wedding anniversary in April. Also surviving are one son, Erik and wife Tecca of Baton Rouge, La. ; three daughters, Sharon White and husband Terry of Winona Lake, Ind., Kristin Kriegbaum and husband Ward of Wheaton, Ill., and Harriett Miles and husband Barry of Hagerstown; 11 grandchildren; 19 great-grandchildren; two sisters, Katherine Stonesifer of Verona, Va., and Betty Eves of Hagerstown; and a brother, George Auxt of Venice, Fla. He was preceded in death by one sister, Dorothy Auxt Feil, medical missionary to Japan, and two granddaughters. A Celebration of Life memorial service will be at 1 p.m. Saturday, Feb. 27, 2010, at Maranatha Brethren Church, Hagerstown. The family will receive friends one hour before the service. Private burial will be at the convenience of the family. Memorial contributions may be made in Andy’s name to Grace Brethren International Missions, c/o Maranatha Brethren Church, 19835 Scott Hill Drive, Hagerstown, MD 21740. Rest Haven Funeral Chapel, 1601 Pennsylvania Ave., Hagerstown, is in charge of the arrangements.